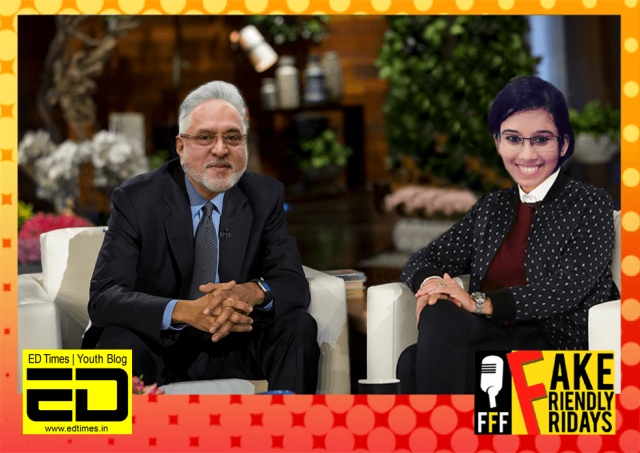 Bikinis, Beaches, And Bankruptcy: ED Times Interviews India’s Own Bhaagi, Vijay Mallya, For This Week’s Fake Friendly Fridays! Fake Friendly Fridays is a section where we pick a famous celebrity and throw fake questions at him/her and in return, we receive fake answers. Why should you not take it seriously? Because it is fake. If you still don’t get it, This is a fake interview written purely on the basis of the author’s imagination of how the actual interview would have been if we had got the chance to interview these famous (for all the wrong reasons) personalities for real. In short, just have a good laugh! Ladies and gentlemen, welcome to this week’s segment of Fake Friendly Fridays by ED Times! Today we have a.. er… well-rounded individual to join us for an interview- the one and only Vijay Mallya! ED: Hello Mr. Mallya, thank you for joining us today. VM: I’ve got to fly out to Mauritius after this, so can we make it quick? ED: (aside) The only place you won’t fly out to is India. ED: I was just wondering if you miss India. VM: Oh well, I do miss my dear model friends in India… nothing can compare to the beauty of Indian women! But the UK isn’t bad, either. It’s a country you can bank on. ED: (aside) Haven’t you messed with enough banks already? ED: Er… so Mr. Mallya, I’m curious- how do you manage to keep up the Kingfisher calendar shoots at exotic locations when all sources declare that you’re bankrupt? Isn’t that why you left India in the first place? ED: (aside) Judging by the number of models, you have many sources of happiness. VM: Speak up, I can’t hear you. ED: I was just saying that we wish you happiness in your endeavours. One more question, Mr. Mallya- do you intend to ever remunerate the employees of Kingfisher Airlines who claim that their salaries went unpaid for months? VM: How many times do I have to say I’m bankrupt?! If the State Bank of India could understand, I don’t see why you can’t! *stands up and looks at Rado watch* Well, it’s time for me to leave. My private jet is waiting. *fake Brit accent* Cheerio!